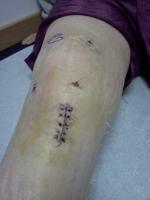 My knee 4 days post op. It's currently June 2011 and i've just had my operation; the injury occured in August 2009 in a soccer match! Quite simply it's been two years of hell, from misdiagnoses and failed rehab from the original diagnosis. All this in the first two years of my university life studying sport & exercise science; which made it even worse as I couldn't get involved in practical sessions. The original injury happen in a soccer match; i'd just signed for a new team and made a few substitute appearances and within the first 10 minutes of my first start for them, shoulder-to-shoulder with someone, and SNAP! fell to the floor in agony! I didn't have a clue what i'd done but I couldn't move my leg at all. I was taken off but after 20 mins I could just about walk again (though it was very painful) and decided to go get changed and get to hospital. Diagnosed in A&E as damage to the medial ligament I was instructed to rest for 4-6 weeks and I would be OK. Come 6 weeks I felt good went training.. Knee collapsed during the warm up. Over the next few months I tried and tried again with the same outcome. I went back to the hospital around April 2010, they didn't change the diagnosis but arranged some physiotherapy for me. That was going well uptil October when I came off my bike hard. The physio noticed a lax in the ACL and informed my doctor who agreed and arranged x-rays and an MRI scan, over the following months, which confirmed a ruptured ACL and damage to the meniscus. So on the waiting list I went! wrong or not being good enough to get back into sport but the alternative of definately not being able to lead an active life was, and still is, keeping me going with it! It was a nervous wait for the op time but after general anesthetic I was out like a light! Woke up over 2 hours later very groggy, uncomfortable and in pain! I'm big enough to admit that I was an emotional mess and couldn't stop crying. I settled down after half an hour and had the situation with medication etc from the nurses explained. But all I wanted to know was how the operation went; a question that wasn't answered for another 6 hours. The good news was the new graft was strong and stable but there was a great amount of damage to the meniscus, the surgeon stiched it up and i've been instructed to put no weight on the leg for 4 weeks! Now, nearly a week after, i've gained a reasonable amount of motion in my knee but it's all still very swollen and I can hardly move it. 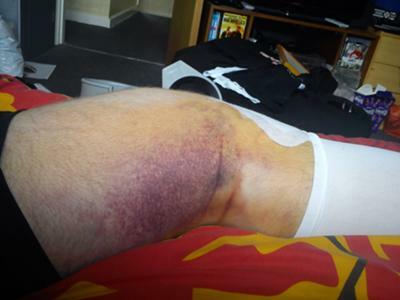 The pain is constantly there and the bruise from the hamstring graft area is horrid (as you can see!) The worst thing though is relying on others for everything; I used to be very independant but now can do very little for myself, that's been very hard for me to take! I'm taking everything one day at a time and hopeing it all works out! My final note would be a thanks to this site for putting my mind at easy over a couple of things like the lack of movement (I was starting to worry that there was a problem) and i've pick up a few of tips as to aiding the recovery.